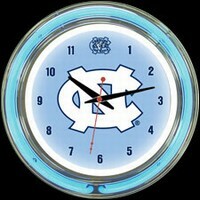 Brightly display your NCAA team pride with an NCAA officially licensed neon clock. It's the ultimate neon clock for any NCCA fan and makes a great showpiece in a game room, bar, or home office. What makes this clock special is that it contains two (2) high quality ½” diameter neon tubes – one tube is inside and one is outside illuminating the school’s logo and team colors from the inside out. In addition, the neon tubes can be left on stationary or you can set them to blink for an added visual effect. Cool two-color arc design with coordinating neon colors illuminates full color logo on clock face. Clock housing made of metal with high polished chrome finish. Quartz clock mechanism powered via AA battery (not included), 110-volt power adapter to power neon bands included. Neon tubes last up to 12 years, even when lit 24 hours a day. 14" diameter, approx 3.25" deep. 8' power cord. Weighs solid 7 pounds. UL Approved. 1-Year Factory Warranty.